Halloween is just around the corner, and it seems to be starting to take off in Australia. 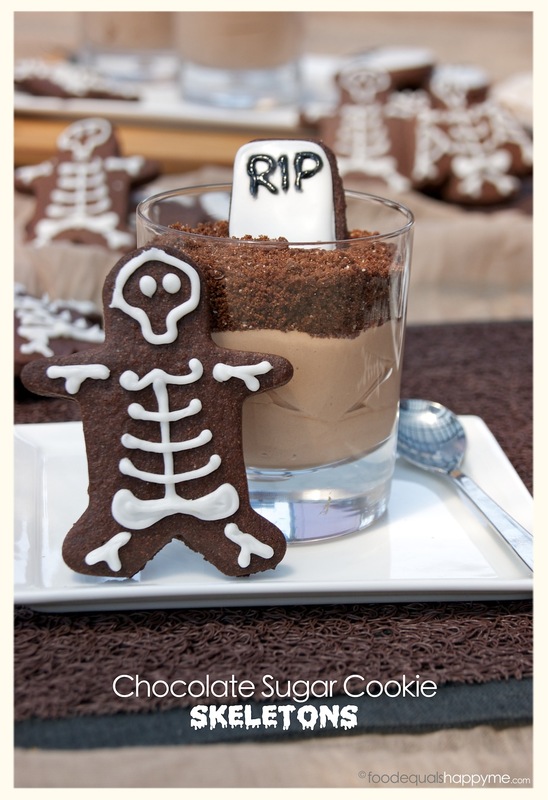 Although I have no desire to dress up nor do I have kids to take trick or treating, making Halloween themed sweets is not something I have a problem with – Especially when we are talking about these Halloween Graveyards with Choc-Hazelnut Mousse, Chocolate Dirt and Chocolate Skeleton Sugar Cookies. Ok so there are two things for me to rave about here, firstly these are hands down the best chocolate sugar cookies. Ever. I think once you make these you will never go back to plain vanilla cookies. 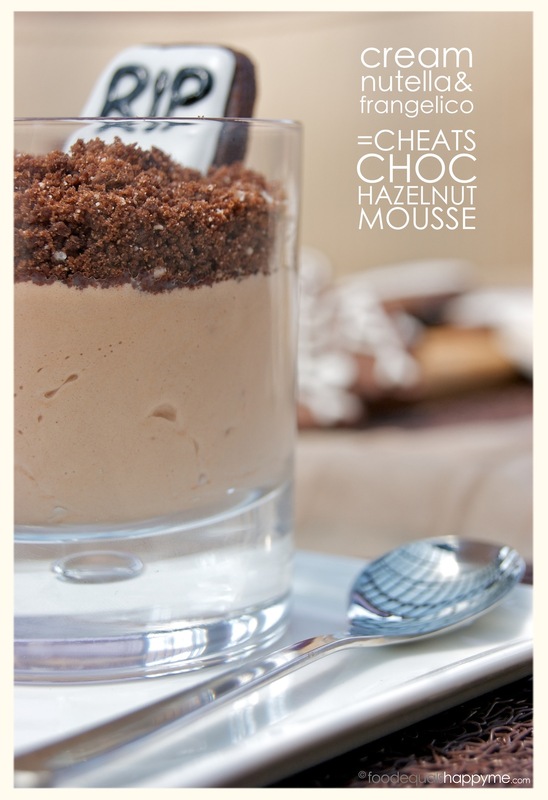 Secondly, when you put these amazing cookies together with this super simple cheats choc-hazelnut mousse it is one of those food marriages that should be illegal because it’s that good. 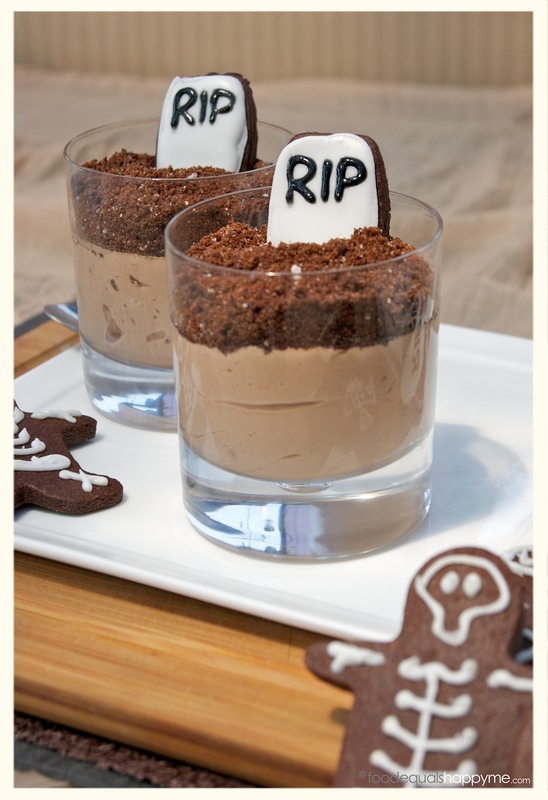 Crunchy chocolate biscuit with creamy choc-hazelnut mousse, I’ll have 4 thanks! 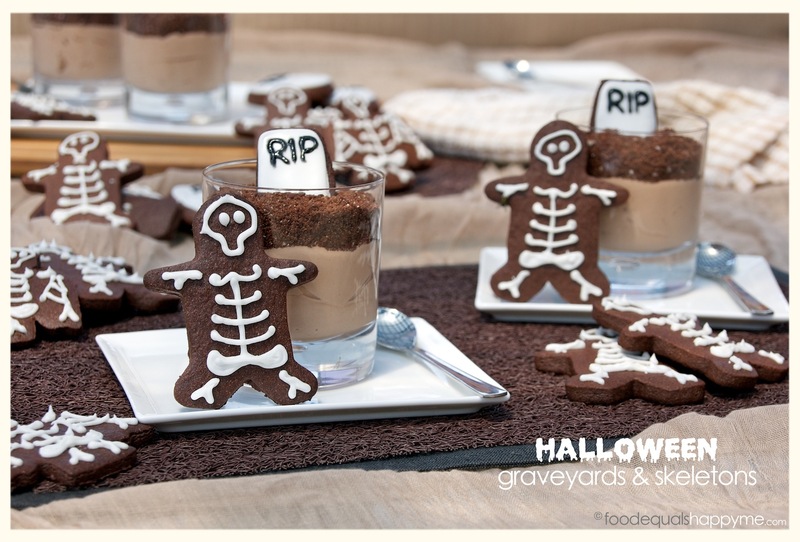 And you can’t deny that when you put them together as skeletons & graveyards, it’s the perfect Halloween themed dessert. To make the chocolate dirt, process (or crush with a rolling pin) the chocolate sugar cookies until they resemble a coarse crumb and set aside. Place the cream in a mixing bowl and whip until it just starts to thicken. Mix the nutella with frangelico and then add to the cream. Continue to whip until combined and thick. Spoon the mixture into 4 glasses and top each glass with the crushed biscuit ‘dirt’. 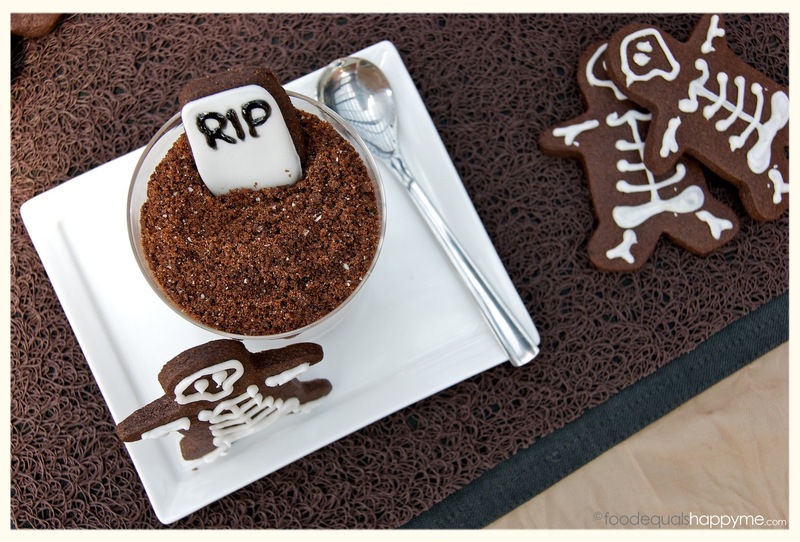 Push a gravestone cookie into the chocolate dirt in each glass. Sift the flour, cocoa and salt into a bowl and mix to combine. Place the butter, vanilla and sugar in a mixing bowl and beat until pale and fluffy, add the eggs one at a time beating well after each addition. Add the flour mixture and mix on low speed until just combined. Split the mixture into two halves, place onto cling film and press it out slightly to flatten. Wrap each one in cling film and refrigerate for 45mins. After 45mins take the dough out of the fridge (one at a time) and place between two sheets of baking paper. Roll it out to around 1cm in thickness, pop it back in the fridge for 15mins. 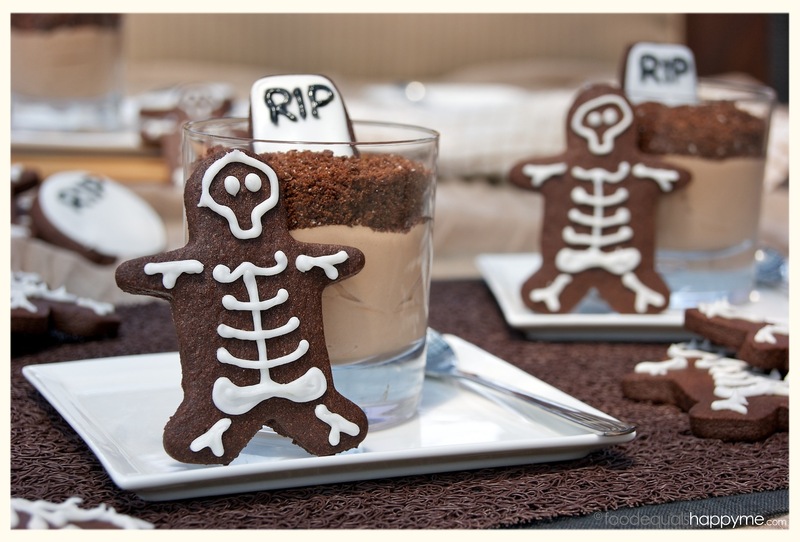 Take the dough out of the fridge and cut into desired shapes (for skeletons and gravestones I use a gingerbread man cutter and an oval shaped cutter) place the shapes onto trays lined with baking paper with 4cms space between each one. Pop the trays into the freezer for 15mins. Don’t waste what’s left after you cut out the shapes, bring it together and repeat the process of rolling and cutting shapes until you have used as much as possible. After 15mins in the freezer bake the cookies in a preheated oven at 170 degrees celcius for 16-18mins or until the edges are just crisp. Leave to cool for 5mins on the trays before transferring to a wire rack to cool completely. 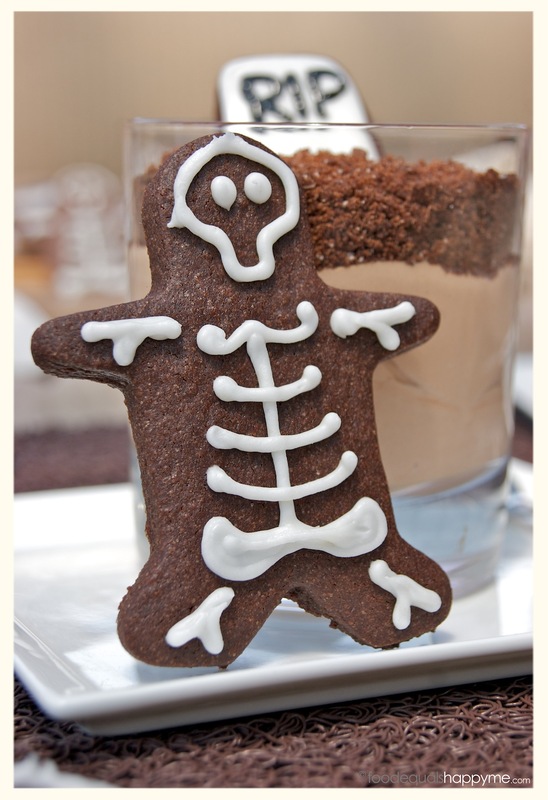 When the cookies are cool decorate in whatever way inspires you. I tend to use royal icing piped on using a small round tip to decorate. To make royal icing you need 1 egg white, 2 tsp of lemon juice or water, and 1 1/2 – 2 cups of sifted icing sugar. Lightly whip the egg whites, then add the icing sugar and lemon juice or water. Add the icing sugar gradually so that you can stop when the consistency is exactly what you want. Use a thicker mixture for piping lines and outlines, and use a looser mix for filling in the outlines. 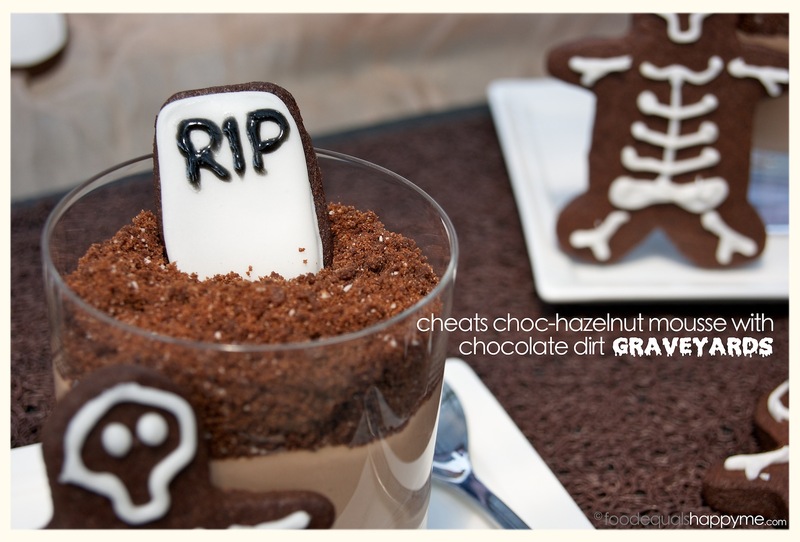 I used a black food writing pen to add the RIP to the gravestones. Love this, how fun! Halloween seems to get more popular every year around Sydney, and this would be just the thing! Yeah it definitely is. Last year I saw so many kids out trick or treating! Schools are starting to organise groups to go round in their local areas too..
wow, these are adorable. 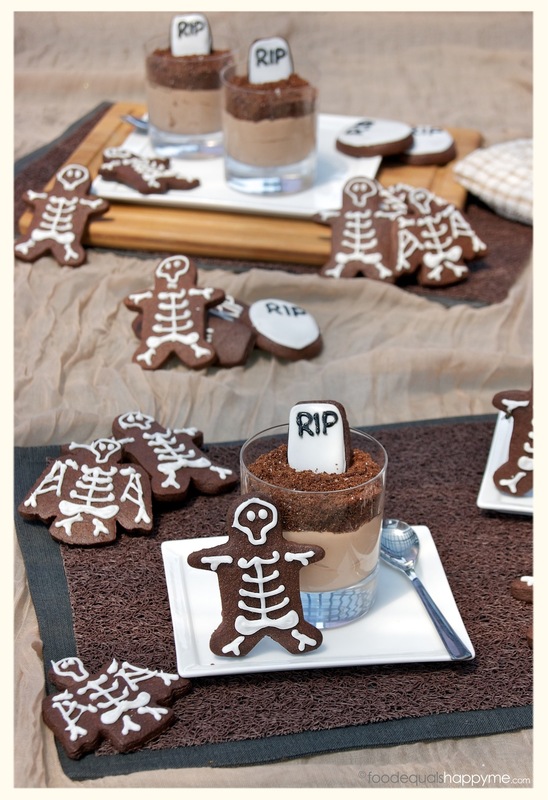 i don’t think i would have the patience to decorate those skeletons with my big fat sausage fingers, but i’m defintely going to send the recipe to my girlfriend. if she makes the cookies, i’ll make the mousse.